History's only four-time world heavyweight boxing champion and one of America's most admired and beloved athletes reveals the dramatic story of his rise from poverty to the very pinnacle of the toughest sport on earth. Barely able to make it into the heavyweight division and almost always the smaller fighter in the ring, Holyfield spent his professional career proving the naysayers wrong. Along the way he provided some of the twentieth century's most thrilling sports moments, not all of them on purpose. 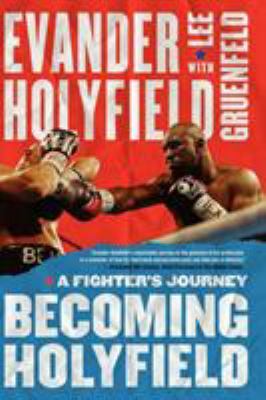 In "Becoming Holyfield," he gives us the exciting inside story of defeating Mike Tyson, the self-proclaimed "Baddest Man on Earth," and then getting a piece of his ear bitten off in the rematch. We learn how it felt to become the undisputed champion of the world by knocking out the man who knocked out Tyson, and we find out what it was really like to be in the middle of a title fight and see a motorized parachute fly right into the ring. There is heartbreak to go along with triumph, beginning with Holyfield's loss of an Olympic gold medal because of a highly controversial disqualification and continuing through his short-lived retirement following a misdiagnosed heart condition. Along the way we're treated to glimpses of such colorful figures as Don King and Howard Cosell and we come to understand the extra-ordinary power of love in shaping a young boy's life, and the love he tried to return. Holyfield made more money in the ring than any other fighter in history, and gave away millions to support the dreams of underprivileged kids looking for the same kinds of breaks that allowed him to become a champion. Holyfield's immense popularity cannot be overstated, and it cuts across all ethnicities and socioeconomic classes. The top three highest-grossing sporting events in Las Vegas history were all Holyfield fights, and his highly rated appearances on "Dancing with the Stars" helped to ensure that show's success. Other fighters may have been bigger, stronger, or more flamboyant, but few could match Evander Holyfield's poise, grace under pressure, or commitment to serve as an inspiration to others.